Peter Hammill am the only one. 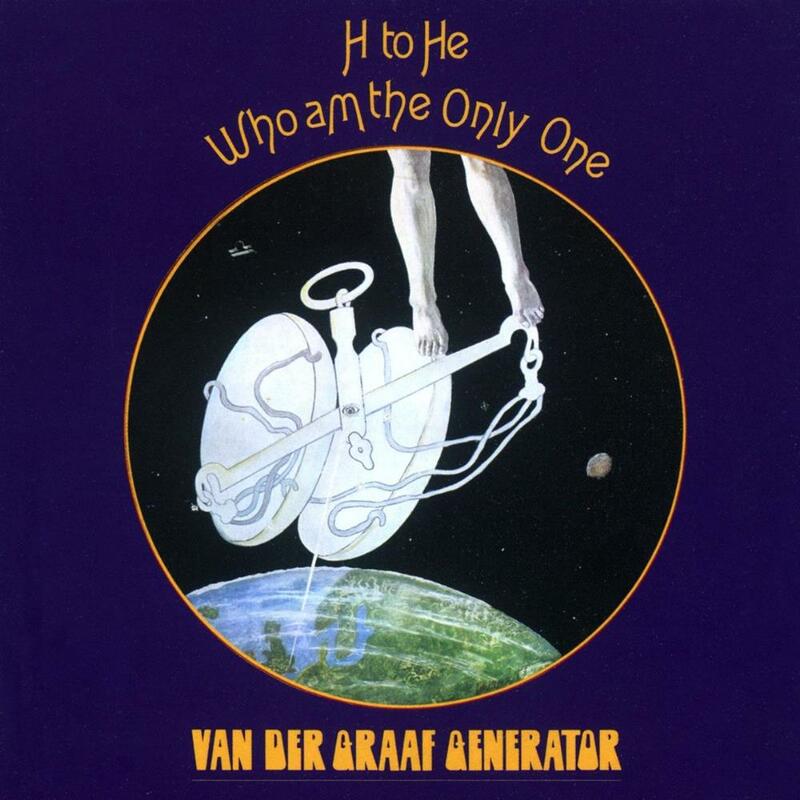 This is H To He, Who Am The Only One, by Van Der Graaf Generator. It is their third album, and it shows them evolving into their trademark sound. This is some of the most theatrical progressive rock I do believe I've heard. Beginning vibrantly, we have fan favorite "Killers". Here is where the band revels well in the guitar-less saxophone rock that weaves a fantastic riff alongside Peter Hammill's immaculate vocal delivery. Right form the start, you'll hear a great deal of organ and saxophone interplay, and this turns into an absolutely brilliant combination. But don't put this band down as a one trick pony. House With No Door compliments well in its dark and haunting ballad style melancholy. A rousing flute accompaniment is added deep into the mix, with lilting melodies floating together with with Hammill. His vocal delivery could carry many of the songs by itself. He is certainly becoming of a skilled opera singer. This album climaxes splendidly, and with powerful emotional resonance. Van Der Graaf Generator usually delve into depressing and darkly melancholy moods interspersed between their aggressive and violent sax rock theatrics. I absolutely love the originality put forth from these individuals, and their ability to attack as a cohesive rock unit. Guest guitarist Robert Fripp shows his talents on Emperor In His War-Room. This song begins mainly as a soft and bleak flute ballad, twisting and turning from stark contrasting soft and hard. Near the end of the song, Fripp and the band let loose with dissonant and fiery jazz blasting that can be quite shocking. The song thus has a slight King Crimson edge to it, of which I don't think anyone could easily complain about. The lyrics are quite deep and add another level to the musical experience. I enjoy Hammill's intonation, and sheer singing abilities. Also, for a progressive band, they deftly weave many hooks and melodies into the songs. The entire band gets a chance to shine, and the music holds a sort of "trademark" diversity. That is to say it is easily identifiable as VDGG, but it is still diverse and varying. The organs, flute, saxophone, and vocals dance so vividly together as to craft a masterpiece of music. The song structures are complex and jazzy. The playing is top of the line, and the creativity is pouring through in waves. Lost is the most overtly jazz based song herein, and features a heavy organ line with saxophone blaring together. It shifts elegantly from a majestic saunter, to a venomous aural assault. A marching build-up makes this song very impacting and powerful. The extended length of the track causes me to feel as if it meanders for too long, but it consistently remains interesting, and is a thoroughly enjoyable listen. A touching and emotional song. The album's closing track is Pioneers Over c. The tribal organ build that kicks it off is quite tasteful. The acoustic guitar used adds even more breadth to the sound, and makes this track an epic and haunting effigy of musical talent. Grandiose in scale, and implemented majestically. Throughout the album, the rhythm section never falters, and add spice at the right times. A mature and complex end to a superb collection of songs. In all, a musical masterwork, and a testament to the creativity of VDGG. I don't recommend this to those who require a guitar to be the forefront, or those who don't care for vocals, or vocals delivered with a very dramatic bent, as the case for those like Hammill, etc. The band gives us a very emotional and creative album with hooks and melodies placed well within complex structures and musical imagery. I love this album, as with most of their work. They create many memorable melodies utilizing saxophone, organ, flute, and Hammill's voice. The themes would be further condensed and refined for Pawn Hearts, but it is in a sort of aggressive infancy, here. Plus, that sax riff to Killer is excellent. Essential VDGG. Worst Moment - Lost, but still great.